Trio likes to roar. Who will roar with him? Lost Island is a delightful series of books that gradually grow more challenging for beginning readers. The tropical paradise of Lost Island sets the stage for tales of two siblings, River and Pebble, who live in a tree house, play with dinosaurs and have pixies as best friends. The stories captivate imagination and keep kids asking for more. 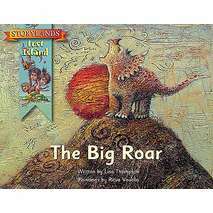 Read along versions of each story are also available online.